My family loves a good pizza… I’m from Chicago so it’s kinda in my DNA. I always go for the DEEP dish heavy thick slices from Pizzaria UNO (one a pretty wide spread chain that has it’s origins in Chicago). But, alas, the pizza caught up with me and in January of this year I signed up with MediWeightloss. Thankfully MJ, my wife. was on board too and in the next few months I lost 55 pounds. Part of the routine was a low carb Acute phase. Needless to say pizza is a tough one. 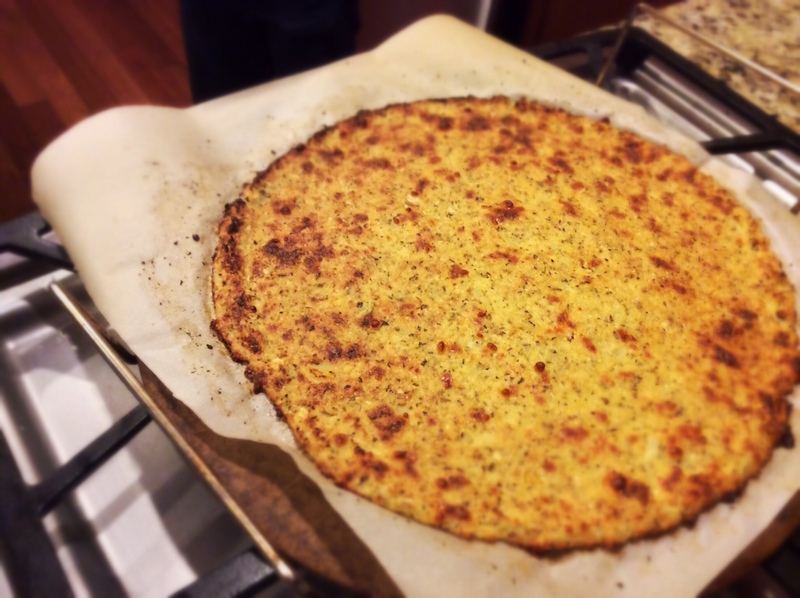 However we found that on YouTube cauliflower pizza crust is all the rage and we loved it. Watch us make the BBQ version HERE on YouTube. 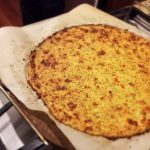 No, it’s not exactly the crun-chewy crusty carbloaded bread we may be craving, but if you love cheesey toppings equally as much this faux crust should be a suitable base to curb your craving for a heavy slice. Wash and dry the cauliflower before cutting off the florets. Discard the stems and leaves. Chop florets into small pieces and pulse in a food processor until it looks like snow (about 30 seconds). Pour cauliflower into a microwave safe bowl, cover and microwave on high 4 minutes. Let it cool slightly and pour cooked cauliflower onto a clean dish towel or cheese cloth. Wrap up tightly, and holding over the sink, squeeze repeatedly to remove as much water as possible. This is key! 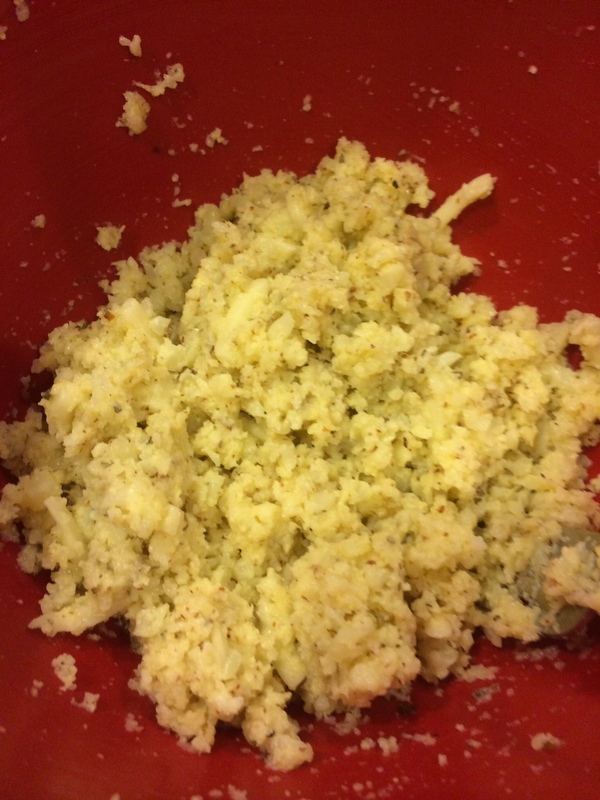 Dump squeezed cauliflower into a mixing bowl. Add egg, spices, cheeses and almond meal, mixing thoroughly. 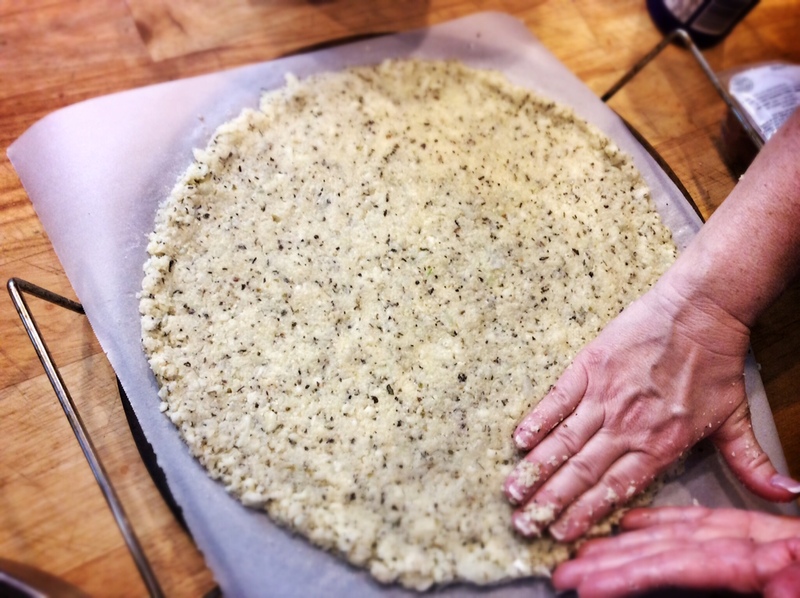 Pour mixture onto a piece of parchment paper and spread out, shaping into a circle about ¼ inch thick. Press a paper towel over the top to remove excess water. Place parchment paper on a preheated grill stone on the grill, close lid, and grill approximately 10 minutes on medium heat until browned. 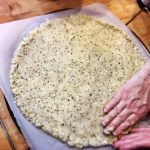 To turn the crust, line a baking sheet with parchment paper. Using a second baking sheet, slide the crust off the grill onto that second baking sheet. Place the parchment lined baking sheet upside down on top of the crust, carefully flip and remove the original piece of parchment paper from the top. 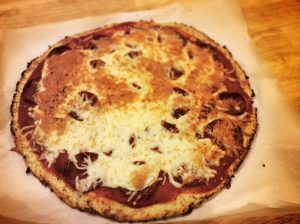 Now using the new parchment paper, slide the flipped crust onto the grill stone. Close the lid and grill another 5-10 minutes until crust is golden brown. Close grill lid and cook 5-10 minutes. Remove using a pizza peel. You can also prepare this with frozen cauliflower florets. Thaw the florets completely and prepare the same, decreasing the microwave time from 4 minutes to 2 minutes. The turkey pepperoni will curl in the oven, so put some cheese on top.